Last week I posted how I made "instant" plants from boxwood cuttings. 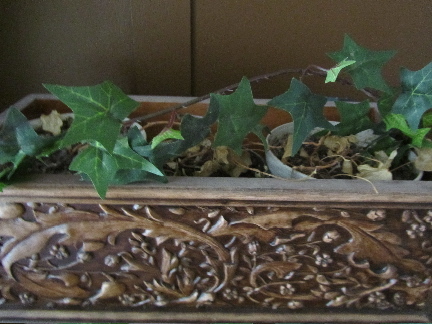 Well, this week, I have my oh-so-fabulous, faux ivy in a planter, made from scraps. 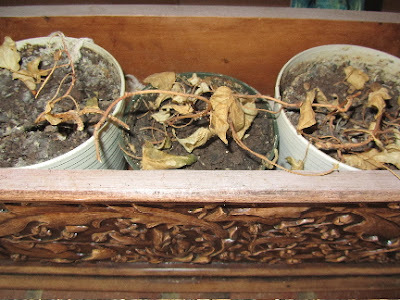 I have a very bad track record with houseplants. You might wonder, "how on earth does Lili keep her garden alive?" after a peek at my houseplants. So, faux is often the way to go. But those silk plants in catalogs are not cheap! Here's my extreme budget version, using what I have on hand. I seem to produce a lot of crafts that use faux ivy. And I always have a few lengths leftover. Here is a planter with 3 pots inside, from 3 once-live ivy plants I had in the house. Anyway, I take one long strand of ivy and cascade it across the top of the 3 pots, to add height and even bulk across the planter, tucking the ends in between the pots and the planter. Then I simply add the short pieces of ivy to the pots, bending one end on most pieces, so they will cascade naturally out the side of the planter, and leaving a few pieces straight and upright to add height. I mass more pieces on one side more than the other, as plants in nature never seem to grow evenly, either. My planter sits on the brick ledge above the fireplace in the family room, at about 5 feet high. Most of us can't see inside the planter, unless we are standing right up against the brick and looking down and in. And even so, one would have to be studying the insides to discern this was indeed faux, and a cheap faux at that. So, for me, it works. Good idea! 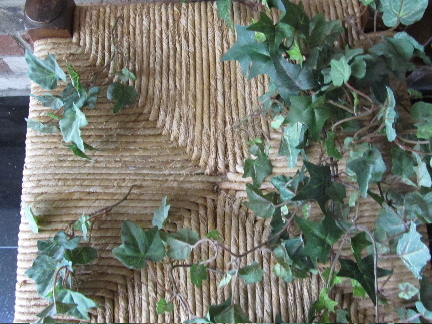 I have used faux ivy in many ways over the years. It's good "filler". It does make good filler, and it seems that have that "real" houseplant/nature look more so than some of the other faux greens. 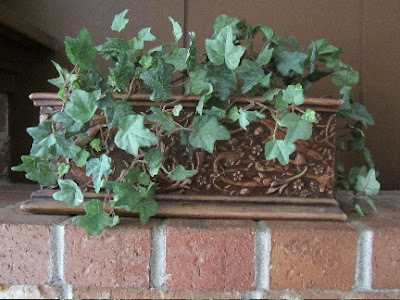 Is there a favorite project you've made with faux ivy? Not really. I've strung them with tulle over curtain rods for window treatments in the past (inexpensive!) but haven't done that in this house. I hate to throw away the ivy--I agree with you, it seems the less "artificial" looking of silk plants. My hubby does the indoor plants and the garden. I'm not the one with the green thumb. You made me chuckle with your "instant," plant! With all of your outside gardening to enjoy and do-"instant," inside is perfect! I hadn't thought of it like this before, but I guess I do prefer to spend my gardening time in the outdoor gardens, over taking care of indoor plants. Have a great Saturday, yourself! That's so funny that you are "house-plant challenged" when you have such beautiful gardens outside! 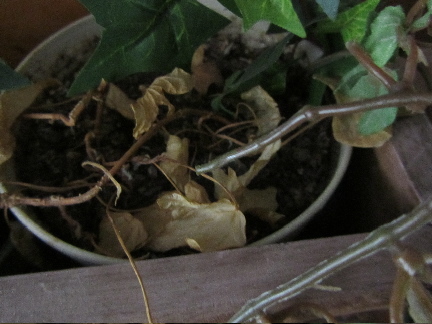 I may have to use your instant plant soon because I'm not very good with my houseplants, either. "Challenged" is an understatement, I'm afraid! I've had at least a hundred houseplants over the years, but have only managed to keep about 4 alive for any length of time. I leave them in pots way too small for their roots, for too long. I forget to water, or I over-water. I just can't seem to get it right with houseplants. I'm glad that I'm not the only one! Some people think that silk plants are tacky. (I call them the plant snobs.) Not me. I like green however I can get it and with four cats, silk plants are the only way I can get it. Nice use of your ivy ends. You have to store them somewhere and why not in a lovely box. Yes, it would be nice to be good with houseplants. But when you're not, or you have obstacles (like cats who chew on things, or dig up stuff -- I had a cat who regularly pawed through houseplant dirt), then you have to find another way to get your "green". Plant snobs -- I think that's a good term! And really, a houseplant, whether real or faux, is more part of the background in a room. Afterall, you don't really go up to someone's ivy and smell it. It just kind of adds to the overall ambience of a room. I tend to think of ivy as a Christmas thing - I guess I need to think out of the box a bit more! Interesting. Perhaps ivy is just a Christmas thing in the UK? There is that Christmas song The Holly and the Ivy. Here in the US I think ivy is a common houseplant. It's on the list of top 10 air-cleaning house plants, along with some palms, pothos, ferns, ficus and a few others. That's really pretty and I'm sure you can't tell it's not real ivy. And I just wanted to say thanks for your advice about the kale, they are seedlings outside so I've moved to pot into a sunnier spot so hopefully they'll have perked up by the time I get back from Melbourne. I hope your kale shows some improvement. It would be nice for you to have some to harvest from your own garden. Have a great time with your family in Melbourne! Frugal spinster, you crack me up! Yes, this was all part of my design, to carefully place the dead strands amongst the faux. It's all in the design! I need to go with faux plants - I tend to kill any houseplant I have. I think yours looks great. Join the club! Would you like to be president or vice president (of the can't-seem-to-keep-houseplants-alive club)?